The need for more energy-efficient computers is urgent. The Department of Energy projects that, with the computer chip industry expected to expand to several trillion dollars in the next few decades, energy use by computers could skyrocket from 3 percent of all U.S. energy consumption today to 20 percent, nearly as much as today's transportation sector. Without more energy-efficient transistors, the incorporation of computers into everything—the so-called internet of things—would be hampered. And without new science and technology, Ramesh said, America's lead in making computer chips could be upstaged by semiconductor manufacturers in other countries. MESO is based on a multiferroic material consisting of bismuth, iron and oxygen (BiFeO3) that is both magnetic and ferroelectric. 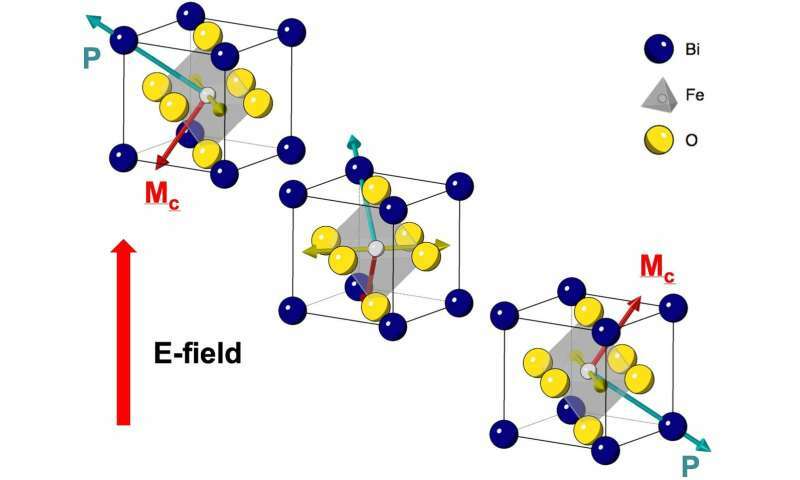 Its key advantage, Ramesh said, is that these two states—magnetic and ferroelectric—are linked or coupled, so that changing one affects the other. By manipulating the electric field, you can change the magnetic state, which is critical to MESO.